Office workers can sleep, grow plants, pour themselves a cocktail and work out in each of these specialised hubs created by students at ÉCAL university. The structures are created using Ronan and Erwan Bouroullec's Workbays system – a set of flexible dividers for Vitra that are designed to let offices be customised into different areas as needed. Created to combat the "too rigid cubicle offices of the 60s" – as workshop leader Camille Blin described it – each of the ECAL-designed office hubs serves a different function. Paula Cermeno's Farm Bay offers a greenery-filled place for workers to tend to plants, while Sara de Campos' Bar Bay borrows the typical structure of many Japanese sushi bars, with cocktails made inside while drinkers sit outside in a circle. For office-goers that need to catch forty winks, Yasunori Morinaga's Nap Bay includes a bed and curtains, while Antoine Chauvin's Capsule Bay offers a pair of stacked bedrooms – based on capsule hotels. 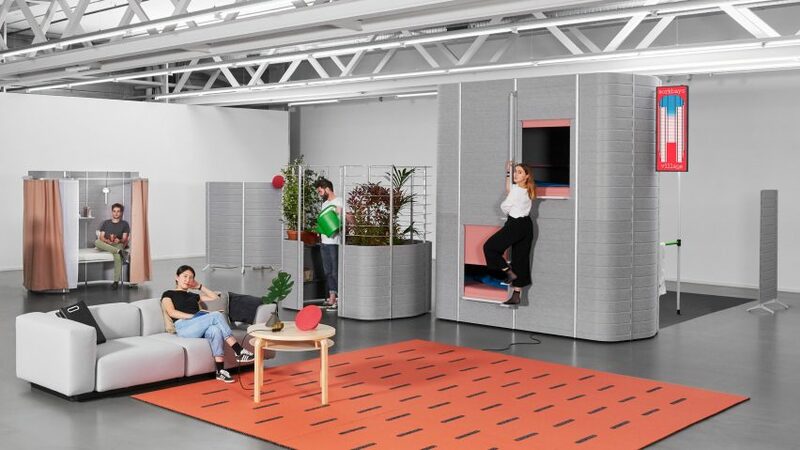 "Through this workshop we tried to emphasise this 'organic' vision of the office by adding functionalities to the Workbays and the work environment in itself, that would create more interaction between the users and with the furniture," Blin told Dezeen. "Just by adding really simple structures to an existing Workbay, it becomes a space for employees to step away from work and exchange in a more casual way." 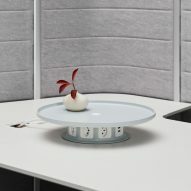 Many of the students also designed new products, including a magnetic lamp by Yen-Hao Chu that can be slid along the felt walls of the bays' partitions, and an in-and-out-style bin by Yeyeon Park that can be accessed from both sides of the felt wall. Workers that prefer to stand up for part of the day can use Christian Holweck's Standing Help stool, which has a particularly high seat supported by an upside-down T-shaped stem. The Bouroullec brothers released their Workbays dividers in 2013, as a way of helping create private space within open-plan working environments. 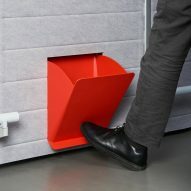 "Instead of storage, we are creating a number of small enclosures in which you kind of nest, you disappear a little," Erwan Bouroullec told Dezeen at the time. 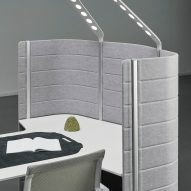 Other designers to tackle the changing nature of the office include Airbnb founder Joe Gebbia, who created a range of adaptable furniture for Bernhardt Design. 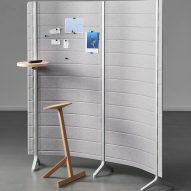 Japanese studio Nendo has also offered alternatives to static partitions, with a set of rolling screens that could be wheeled around the office to encourage creativity.